Quentin Tarantino has been a fan and friend of Troma for years, and when he made Kill Bill in two volumes to create an “Event Film,” Lloyd Kaufman took note. 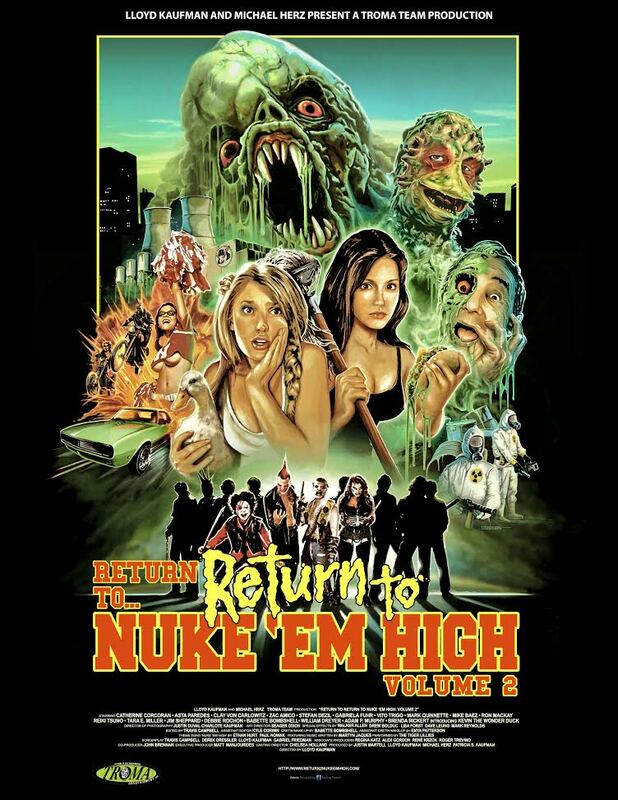 “Michael Herz and I decided that to mark Troma’s 40th year we, too, would produce an ‘Event Film’ in two volumes just like Quentin did,” says Kaufman, “except slightly less lavish in the budget area.” Return to Nuke ‘Em High: Vol. 1 & 2, directed by Lloyd Kaufman, is a hilarious, thoughtful sci-fi “Event Film” with themes ripped straight from today’s headlines: the contamination and degradation of the world’s food supply, rampant bullying, and LGBTQ love triumphing over prejudice and violence. The film, a revisiting of Troma’s 1986 Class of Nuke ‘Em High is in the same vein as other classics such as Class of 1984, Rock ‘n’ Roll High School, and Carrie, but seen through the unique vision of Lloyd Kaufman and the Troma Team. Welcome to Tromaville High School where, unfortunately, the glee club has mutated into a vicious gang of Cretins. Chrissy and Lauren, two innocent lesbian lovers, must fight not only the Cretins, mutants and monsters but also the evil Tromorganic Foodstuffs Conglomerate. Can they and Kevin the Wonder Duck save Tromaville High School and the world? Established in 1974 by Yale friends Lloyd Kaufman and Michael Herz, Troma Entertainment is one of the longest-running independent movie studios in United States history, and one of the best-known names in the industry. World famous for movie classics like Kaufman’s The Toxic Avenger, Poultrygeist: Night of the Chicken Dead, Class of Nuke ‘Em High, Mother’s Day and Tromeo & Juliet, Troma’s seminal films are now being remade as big budget mainstream productions by the likes of Brett Ratner, Richard Saperstein, Akiva Goldsman, and Steven Pink. Among today’s luminaries whose early work can be found in Troma’s 800+ film library are Trey Parker, Matt Stone, Jenna Fischer, Robert De Niro, Dustin Hoffman, Kevin Costner, Fergie, Vincent D’Onofrio, Samuel L. Jackson, James Gunn and Eli Roth. Visit Troma at www.troma.com.